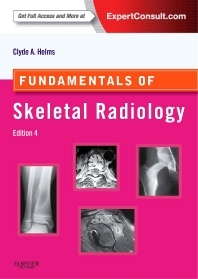 "Some may lament the cover colour and although the fourth edition ‘pink book’ is a more subtle cerise these days, it is still the go-to guide for skeletal radiology and the pearls that every reporter needs in order to build a firm foundation of MSK knowledge"
"Whilst the books primary audience is radiology residents in the USA it is an excellent book for all students of medical imaging and one that I recommend to all those who are developing an interest in skeletal imaging." "A clear, concise and quick reference, dipping into the pages is like slipping on a favourite pair of slippers – comforting and reassuring! Helms’ style is warm, conversational and often humorous which makes for easy reading of complex chapters such as those on arthritis and metabolic bone disease...The author himself states that after reading this book, the reader can go on and research their chosen topic further with more in-depth texts. It is well worth taking the time to follow up on the references at the end of each chapter as Helms’ recommendations are relevant and need further exploration...There are several updates to this the fourth edition that are most welcome and enhance it further. The images have been more clearly reproduced so that bony abnormalities are more easily spotted and the reference to the image within the body of the text is near to the image itself, making reading flow more smoothly...The overall feel of the book is slicker and smarter and although the pages are now glossy, I am sure they will end up well-thumbed in the hands of radiologists, registrars and radiographers alike."